Crochet lesson #2, coming right up! How are we doing so far? Are things making sense? 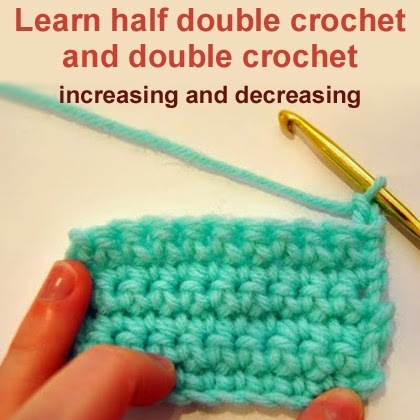 On Monday, we covered the chain stitch and single crochet, and we're moving along today to the next two basic stitches, the half double crochet and double crochet, and a quickie lesson on increasing and decreasing your stitches. If you're feeling pretty comfortable with the single crochet from our last lesson (click here if you need a review), you should be able to pick up these new stitches pretty easily, since they're just a variation on the single crochet stitch!